February 12 will mark President Abraham Lincoln’s 210th birthday. Few places in Illinois played a more important role in shaping Lincoln’s political success than Bloomington-Normal. It was home to some of Lincoln’s closest friends and colleagues, including Jesse Fell and David Davis, and its residents became some of his most important backers in his pursuit of national office. Bloomington-Normal is so significant in Lincoln’s life that we are considered a gateway in the Abraham Lincoln National Heritage Area. The Looking for Lincoln tour offers you a chance to walk in Lincoln’s footsteps. You’ll see the places where he stayed, worked and visited during his time in BN. Lincoln made his first visit to Bloomington-Normal in 1837 when he was a lawyer on the eighth judicial circuit. During this time, he met Fell and Davis, who would become two of his closest friends and political allies. Lincoln occasionally stayed at Davis’ mansion in Bloomington, Clover Lawn. A new mansion was built in the 1870s, which is today open for tours as the David Davis Mansion. It’s a rare glimpse into the daily lives of a wealthy Victorian family. Many of the stops on the Looking for Lincoln tour are located in Downtown Bloomington, the site of the McLean County Courthouse where Lincoln practiced law. The original building no longer exists, but in 1904 a new building was built on the site and is now the McLean County Museum of History. The museum reveals the lives of the people who shaped McLean County, including those who encountered and knew Lincoln. Also in downtown is the site of Lincoln’s “Lost Speech,” on the corner of Front & East Streets. In this speech delivered on May 29, 1856, Lincoln condemned slavery. Just a few blocks away is the Miller-Davis Building, where Lincoln would visit with clients in the law office of Davis in an annex to the building. 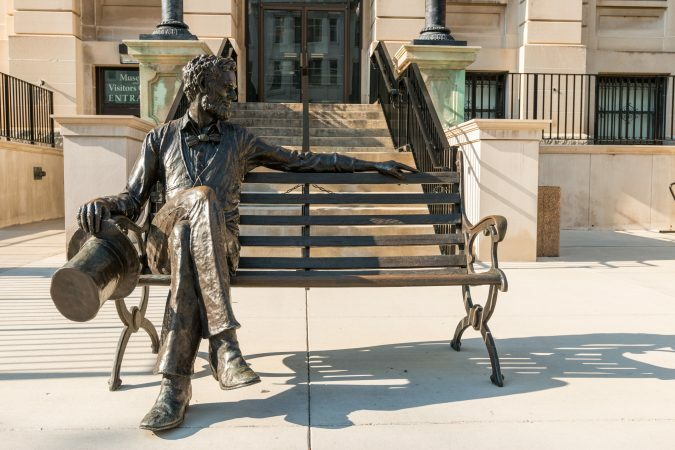 In addition to the tour, each summer Lincoln’s Festival on 66 gathers together people throughout Central Illinois who feel a shared sense of pride in the area’s deep connection to our 16th president. Each of the locations that host the festival feature a different activity. You’ll experience Civil War re-enactments, traditional craft demonstrations, talks, tours and more. 158 years after Lincoln’s last visit to Bloomington-Normal, our connection to him is stronger than ever. Walking around town today, it’s easy to picture Lincoln going about his day: walking down the steps of the McLean County Courthouse, bent over his paperwork in his office, tipping his famous top hat in greeting to a stranger. Fore more information on Looking for Lincoln, give us a call at 309.665.0033.